There are many names for the type of police patrol associated with protecting lakes, canals, rivers and harbors. 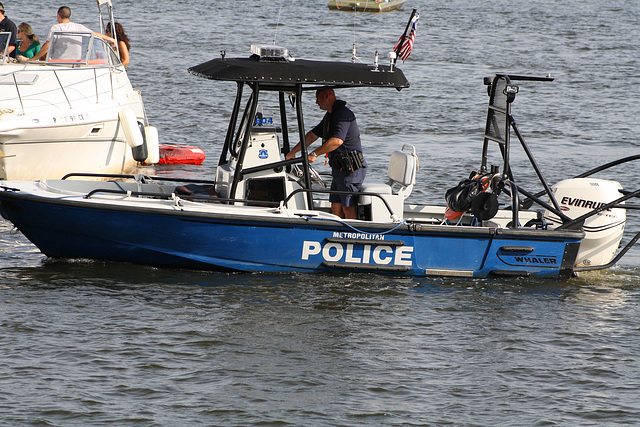 Some departments call their police water patrols a boat unit, water police, harbor patrol, port police, marine unit, river police, maritime police, nautical patrols, and bay constables. All of these different names are referring to sworn police officers with powers of arrest who patrol and protect our waterways. In the United States, the nation’s first harbor patrol unit appeared in 1853, established by the Boston Police Department. New York City Police Department created a Harbor Unit on March 15, 1858. The Baltimore City Police Department created a Marine Unit in 1860, and the Metropolitan Police Department in Washington, DC created a Harbor Patrol in 1861. On the west coast, the Seattle Police Department created a Harbor Patrol in 1870 to enforce maritime law. The United States waterways are protected by federal, state, city, and local law enforcement agencies working in a combined effort to provide homeland security and enforce laws to insure our busy waterways are protected and safe. The U.S. waterways provide economic and recreational value. Protecting the waterways in police department’s jurisdiction requires accessing the right type of watercraft that is effective in accomplishing the law enforcement mission of protecting and serving. Police Marine Units train continually so that their boating and maritime skills provide confidence to the communities they serve and protect. Posted in Mark's Articles and tagged bay constables, Harbor Patrol, marine unit, maritime police, nautical patrols, Patrol Procedures, Police, Police Patrol Strategies, port police, river police, Sheriff. Bookmark the permalink.